AHP - The best way to prioritize projects? The Analytic Hierarchy Process, normally called AHP, is a powerful yet simple method for making decisions. It is commonly used for project prioritization and selection. AHP lets your capture your strategic goals as a set of weighted criteria that you then use to score projects. It’s the “how” that matters - AHP structures the collaboration between your different stakeholders (executives, business unit heads, subject matter experts, etc.) and uses decision science to improve both the quality of and the buy-in to your decision. The result is a ranked list of projects - each project having a score between 0 and 100 - that you can use to drive your project selection and resource allocation decisions. This score represents how well your projects are aligned to your strategic goals and projects that are aligned with strategic goals are 57% more likely to achieve their business goals (read more: 8 Benefits of Strategic Alignment of Projects). For decades, researchers have been inventing and evaluating different methods of prioritizing projects and, so far, the Analytic Hierarchy Process is the winner. Project prioritization is a difficult problem. You have a diverse set of stakeholders who want to “get projects done”. You also have a finite set of resources to deliver those projects. There are never enough resources to satisfy everyone’s needs. Your projects are the mechanism to achieve your strategic goals and picking the wrong projects, therefore, means your organizational performance suffers. Research carried out in business schools and departments of engineering, in psychology labs and in operations research groups right around the world has invented, refined and evaluated over 100 methods of prioritizing and selecting projects. In 2017, the University of New South Wales published a review of all of this work. The result is that only two methods of prioritizing projects were found to be suitable, and the one that was deemed to be most usable is the Analytic Hierarchy Process. You portfolio exists to deliver your strategic goals. The challenge is that your stakeholders don’t all agree on which goals are most important. They may not even agree on what the goals really are! To make matters worse, each individual is, let’s be frank, human. Humans are poor at making rational decisions that involve multiple “dimensions.” As soon as you come up against a decision with more than 2 or 3 “dimensions”, the subconscious kicks in and that’s when the problems really start. Biases will influence the decision without the decision-maker even being aware of it. AHP helps address this. It structures the decision in a way that helps reduce decision bias, that ensures every voice is heard and that actively builds consensus between your stakeholders. The result, which has been validated by researchers around the world, is better decisions with a strong commitment to action from your stakeholders. In concept, AHP is very simple. You define and evaluate a set of business goals which translate into weighted criteria. You score each project against those criteria and calculate a weighted score for each project. The process is similar to a weighted score from a spreadsheet or a project prioritization matrix, but with a couple of important differences. It’s HOW you do the weighting and scoring that differentiates AHP-based project prioritization. The most important difference between AHP and other methods is the way in which you weight your criteria. AHP breaks this question up into a number of small judgments. You are shown pairs of criteria and then tell the software which criterion is more important (and by how much). This simple process helps reduce bias because each judgement is “small enough” for you to make it rationally, without relying on the (biased) subconscious. Crucially, AHP is also a team sport. Your various stakeholders get to vote on which criterion is more important. Sometimes there will be good alignment, but other times, such as in the following image, the stakeholders disagree. Identifying the differences of opinion allows you to have a quick discussion about why your stakeholders disagree. This process encourages your stakeholders to listen to each other and to learn about other teams’ needs. It means the issue is viewed from a number of different directions, reducing any individual’s bias. The “loudest voice” no longer wins just because it is the loudest voice. When the group comes to agreement on what the overall vote should be, everyone understands where this vote came from and, typically, the stakeholders walk away from this discussion with a strong sense of ownership. When you’ve going through all the pairs of criteria, AHP software like TransparentChoice will find the best fit to your data and will calculate the weighting for your criteria. 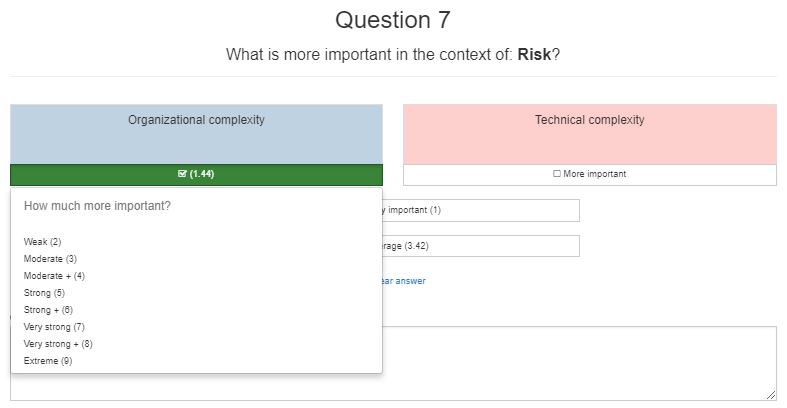 Now you’re ready to start, scoring your projects against the criteria. This should also be a team sport. Good AHP software lets you bring together different opinions on how a project might, for example, improve customer retention. Crucially, different perspectives help improve the quality of the decision, but they also help build buy-in and trust in the scores you finally calculate. Which, of course, is the next step. Combining the weighted criteria with the scores for each project gives you a weighted score for each project. You should end up with something like this; a ranked list of projects that you can use to make project selection and resource allocation decisions. Some people try to use spreadsheets that do all the maths of AHP. But that’s totally missing the point. AHP is about people. It’s about collaboration. It’s about knowledge-sharing and consensus-building and a spreadsheet simply won’t do that for you. Implement AHP in a spreadsheet will often leave stakeholders confused and with a sense that this is “decision-making by numbers” and has nothing to do with the real world. AHP-based project prioritization software is a pretty rare beast and we like to think that TransparentChoice’s software is the best. We certainly put a lot of effort into making it easy to use and to keeping the cost of ownership down. It’s this ease of use, the visual nature of collaborative voting and the discussions that follow that transforms AHP from an exercise in math to a powerful tool to make great decisions, ones that enjoy strong buy-in. If you’re considering using AHP to help prioritize your projects, here are 5 questions to ask before deciding on a project prioritization tool. To learn more, you can download this AHP Brochure. Analytic Hierarchy Process (AHP) was developed in 1970s. Since then, our knowledge on good decision-making increased significantly and scientists have developed lots of new decision making methodologies. This section contains a few reasons why AHP is still a good choice for making collaborative decisions. 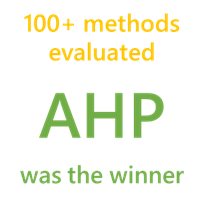 For the last 30-35 years AHP has been thoroughly tested by thousands of organizations from around the globe… and it seems to work! There are lots of case studies that describe how large organizations used AHP for their strategic decisions to achieve better outcomes. When you look into the case studies you will notice that it was used for variety of decision making problems. Having one good approach lets good decision making become part of your everyday processes; part of your culture. People don’t feel comfortable taking recommendations from software if they don’t understand how it works. They don’t need to know the details but they want to understand the idea behind it. For AHP, you break a complex decision into explicit goals, alternatives and criteria. You prioritize criteria and evaluate alternatives in light of those criteria. People get it. In contrast, some more recently developed methodologies have a process and underlying math that is so complex that the software becomes a “mathematical black box”. It takes your input and returns recommendations. What happens in between is a mystery (at least for a regular human being) and that undermines trust. And trust is really important when it comes to the final outcome. Using Analytic Hierarchy Process for your collaborative decision making works because, with AHP, you can explain how it works. When you make important decisions, there are always conflicts between criteria. For example, “minimizing price” and “maximizing quality” are often contradictory goals. This is made worse when you're working in a team. Collaborative decision making, by definition, means people have different views and priorities. Decision making best practice involves taking into account all important criteria. However, this "best practice" is often ignored as multi-criteria analysis is much more challenging than, say, making a decision based on just the price. Analytic Hierarchy Process allows you to take into account all important criteria and to organize them into a hierarchy. Some decision-making methodologies ask participants to assign weights to criteria. The question is, "How should I set those weights?" Well, however Fred in Finance does it, Sally in Sales will disagree. Participants always have different priorities and without a supporting process, it is hard to reach consensus. Some methodologies are missing this key mechanism. It leaves your group with an unresolved problem. And then the very smart quants dive in. They've developed another group of methods where weight of criterion is not a value but function. From theoretical point of view this might be a good concept but it is usually very hard to use for real collaboration. If it is hard to agree on a value, and people need sensitivity analysis to check different scenarios, it will be much harder to agree on a function with a weird shape. How was the function developed? Shouldn't it be a bit different? Remember what I wrote about “mathematical black boxes”? This is another. And it's a Pandora's box. I wouldn't recommend you open it unless you want to spend a lot of time with equations and whiteboards. In AHP, setting priorities is resolved with pairwise comparisons. Each participant is individually asked, "Is A or B more important, and by how much?" After that, you review comparisons together, discuss and try to reach consensus on their values. If consensus is not possible you can use average value and move forward. Then, your collaboratively-agreed comparisons are translated into weights by an algorithm. This is a process that is centered on collaboration and which has a mechanism that helps to eliminate deadlocks. We are all humans and it's our prerogative to be inconsistent sometimes. We make mistakes. When we make collaborative decisions there are multiple people that can make mistakes and be inconsistent. Is there any wonder so many group decisions end in deadlock and confusion? Fortunately, AHP can eliminate some of these problems. You deliver redundant data (more than needed) and an algorithm checks to see if your input is consistent. Good supporting software can then identify these inconsistencies and help you address the ones that need to be addressed. The ancient Greeks invented democracy, and it's still the most successful system of government. But nobody today would implement it the way they did 2,000 years ago. So it is with AHP. Analytic Hierarchy Process is not the latest methodology but it is a well-proven process for collaborative decision making. It is one that is accessible to everyone and is affordable so that it can be used for decisions large-and-small. Even though AHP is simple in concept, the math is time consuming, so good software will help you roll it out with confidence. AHP software can also help the consensus-building process and generates graphs and data that help get that crucial executive sign-off. Over 800 academics and students have used TransparentChoice to support their research and learning. We offer free AHP software that allows students to become familiar with the basics of AHP without overloading them with “enterprise capable” features. For researchers, we offer the Academic Sponsorship Program. This program lets qualifying researchers access our powerful enterprise-strength software at greatly reduced prices in return for participating in our AHP knowledge-sharing program. This program is designed to help AHP research make the leap from the lab to the real-world.